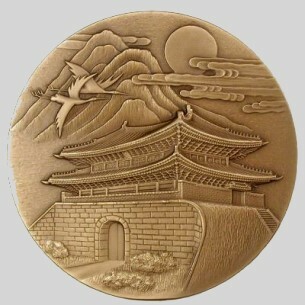 On the obverse side of the participants' medals were put Korea's National Treasure No. 1, Namdaemun (South Gate), flanked by such familiar motifs in ancient Korean folk paintings as the mountain, cloud, crane and the sun. 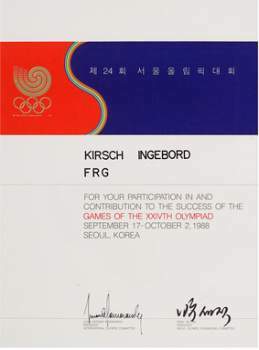 The reverse side showed the Seoul Olympic sash and the order, venue and the year of the Games under it. The participants' medals, which are the IOC's official commemorative medals, were presented to all participants including the athletes and delegates. 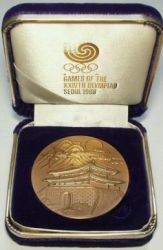 The participants' medal was made of bronze in the same size with the bronze medals. 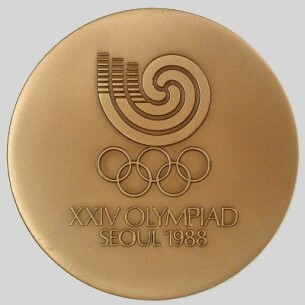 The medal containers were made of high-quality blue velvet, giving fresh yet soft impression. A total of 20,400 participants' medals were produced and distributed to all participants through the Olympic Village, Headquarters Hotel and designated hotels.